This Impex Crystal Art 4 light cylinder chandelier in polished chrome is magnificent, contemporary and made in Britain. Featuring a polished chrome ceiling mount, chain suspension, polished chrome circular frame and 5m curtain of faceted rectangular crystals hanging down, creating a beautiful sculpture. The five lamps are contained within the crystal curtain creating a glimmering light. This bright luxurious feature centrepiece is fitted with five LED spot lamps that shine down through the fitting and will create the most wonderful effect when lit. This statement piece crystal light adds luxury to any space and is a great source of illumination. Capture the shimmering world of refracted light with the Crystal Art collection whilst adding a focal point to any room. Ideal for use over a staircase, double height spaces or anywhere with sufficient ceiling height. Searching for unusual lighting features to complement an ultra-modern or contemporary space can sometimes prove difficult, especially if you are looking for something with the wow factor. Well here it is and made in Britain too! Custom made sizes of this wonderful chandelier are available in 40cm diameter and 1.5m to 5.5m drop lengths. Please contact us with your requirements to enquire about this service. Please note that this chandelier body is 5m tall and is supplied with an additional 50cm of chain but can be ordered with any length. Please contact us if you would like this option. It must be fitted with LED lamps (not supplied) up to a maximum of 6w each. There are alternative fittings available in the Crystal Art collection that can be viewed below. 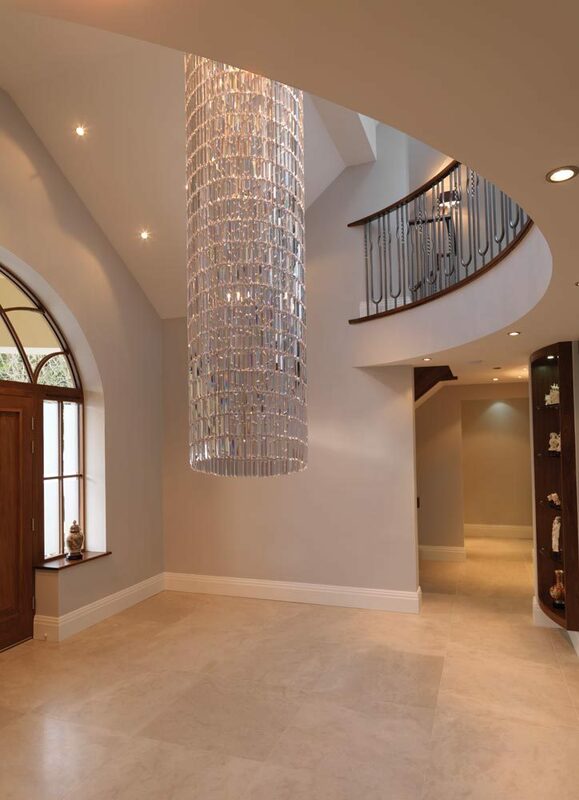 Impex Lighting are one of Europe’s leading manufacturers who supply a comprehensive ranges of fittings in traditional, contemporary and classic styles like the Crystal Art 4 light cylinder chandelier in polished chrome featured here.